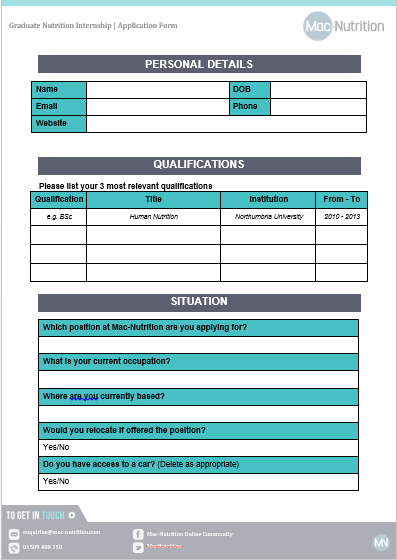 Please note this nutrition internship is applicable to graduates of any nutrition related degree or those who have an Undergraduate degree in sports science (or related area) and are currently studying a Postgraduate qualification in nutrition. The post will involve supporting and working in a variety of areas of nutrition. Mac-Nutrition is an established consultancy, providing nutritional services to the general population, corporate sector and sporting bodies, teams and individuals. 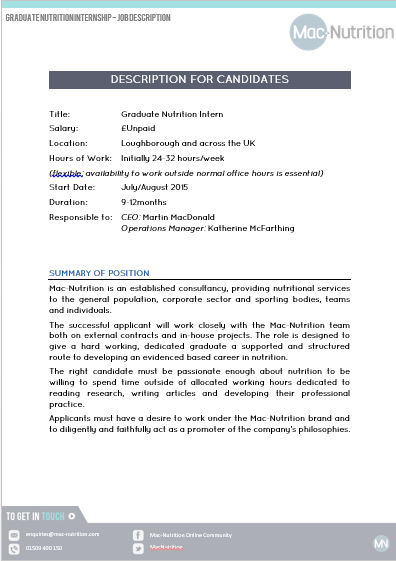 The successful applicant will work closely with the Mac-Nutrition team both on external contracts and in-house projects. The role is designed to give a hard working, dedicated graduate a supported and structured environment to gain experience as a route to developing an evidenced based career in nutrition.